Ready in 2 mins. Genuine goodness. No added salt. Gluten free. Free from artificial colours, flavours and preservatives. Suitable for vegetarians.Our Classic Grains have been selected to help you create delicious and wholesome meals in minutes. 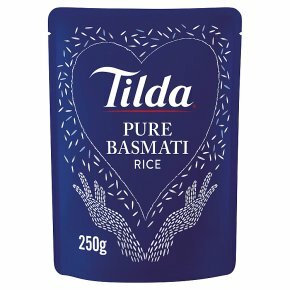 Tilda sun-kissed Pure Basmati grains are steamed to perfection so you can savour their magical aroma and tantalising taste. Why not try... Perfect with your favourite curry or chilli con carne. Add herbs and chopped vegetables for a quick stir fry.